I have been facilitating a PLC group of elementary teachers in my school district on an inquiry into Project-Based Learning, and during our session yesterday, we spent a lot of time reading about teachers’ experiences with PBL with our common text – A.J. Juliani’s PBL Playbook. None of us have tried a full PBL unit yet with students, so we are all figuring our way forward, together. 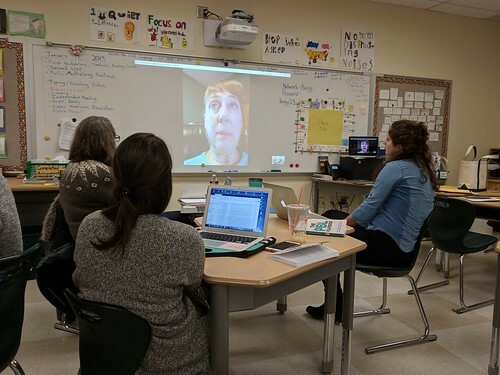 Along with reading vignettes from the classroom, via PBL Playbook, I also wanted us to be able to hear from a teacher with experience using PBL, so I reached out to my friend, Charlene, from my CLMOOC network (and beyond). Charlene has been working with PBL concepts for many years now, as a teacher and as a coach. Her blog has been one of my resources. Charlene readily agreed to video into our session, and for about 30 minutes, she gave us her insights and answered questions. For that, I am very grateful. Grateful that Charlene took time out of her day to share her expertise and knowledge with teachers she doesn’t know. Grateful I have built a network of people I can turn to when I know I don’t know what I need to know. Grateful I can learn from my friend, and that my friend is willing to step up to help us learn. Grateful that I can help connect those connections (from my online friends to my teaching colleagues). Thank you, Charlene. I am deeply appreciative. Thank you, Kevin. It was a total pleasure chatting with all of you! And, I agree, connections add such richness to our experience. I look forward to seeing how your PBL group evolves.